What does alcohol have to do with nutrition, anyway? Believe it or not, alcohol is considered a food because it provides us with energy! 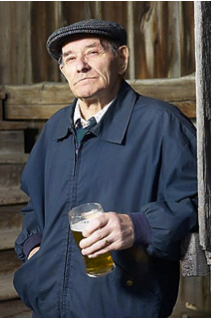 This blog entry is for older adults interested in alcohol’s effects on their changing bodies. What are current recommended limits for adults? This recommendation does not take into account the many health risks and benefits of alcohol for older adults! There are changes in the aging body that increase alcohol’s effects. How are alcohol’s effects increased in the older adult? See the diagram below for a better understanding of alcohol’s path in the body. Mouth: alcohol enters the body. Stomach: some alcohol gets into the bloodstream in the stomach, but most goes on to the small intestine. Small Intestine: alcohol enters the bloodstream through the walls of the small intestine. Heart: pumps alcohol throughout the body. Brain: alcohol reaches the brain. Liver: alcohol is oxidized by the liver at a rate of about 0.5 oz per hour. Decreased body water to fat ratio – The body of the older adult naturally increases in fat content and decreases in body water. Alcohol can be diluted in water but not in fat (think about it, if you added liquor to cooking oil would it mix or separate?). With less water available for dilution, alcohol is more concentrated in older adults. Decreased liver efficiency – Meal contents, including alcohol, are broken down in the digestive system and enter the bloodstream, which is filtered by the liver. Enzymes responsible for filtering and breaking down alcohol become less efficient with age, leaving more alcohol in the blood and the body. Increased permeability of the blood-brain barrier – This is just a fancy way of saying that potentially harmful contents of our blood (like alcohol) are delivered more easily to the brain. Enough science, should I drink or not?! Alexander, F. & Duff, R. W. (1988). 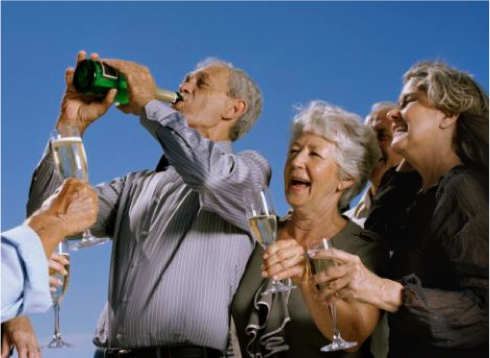 Social Interaction and Alcohol Use in Retirement Communities. The Gerontological Society of America, 28(5), 632-636. Lakhani, N. (1997). Alcohol use amongst community-dwelling elderly people: A review of the literature. Journal of Advanced Nursing, 25, 1227-1232. Mukamal, K. J., Kronmal, R. A., Middleton, M. A., & O’Leary, D. H. (2003). Alcohol consumption and carotid atherosclerosis in older adults. Arterioscler Thromb Vasc Biol, 23, 2252-2259. Mukamal, K. J., Kuller, L. H., & Fitzpatrick, A. L. (2003). Prospective study of alcohol consumption and risk of dementia in older adults. JAMA, 289(11), 1405-1413. Wagner, E. H., Lacroix, A. Z., Lou, G., & Suzanne, L. G. (1994). Preventing disability and falls in older adults: A population-based randomized trial. American Journal of Public Health, 84(11), 1800-1806.